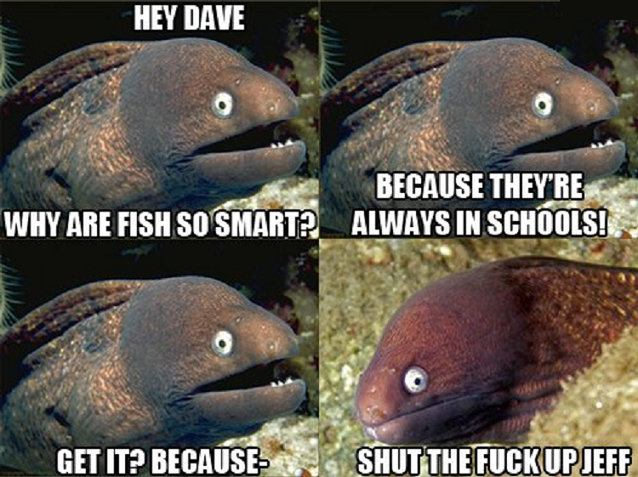 This first "Bad Joke Eel" meme I found on the internets, pretty much explains the whole meme in a nutshell. 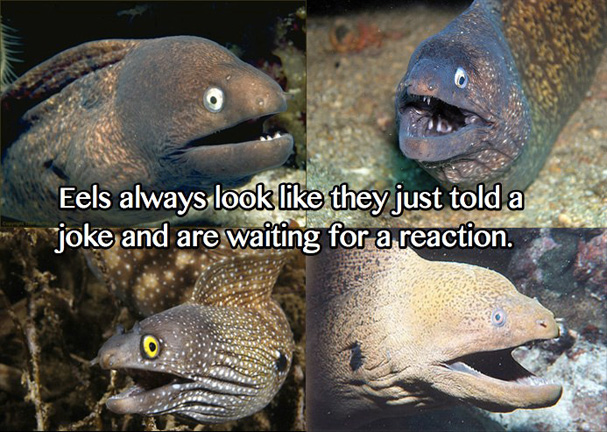 Someone thought eels looked like they just told a joke and are waiting for a reaction... and, I guess they kinda do! Bad Joke Eels Jeff and Dave: "Why are fish so smart?" 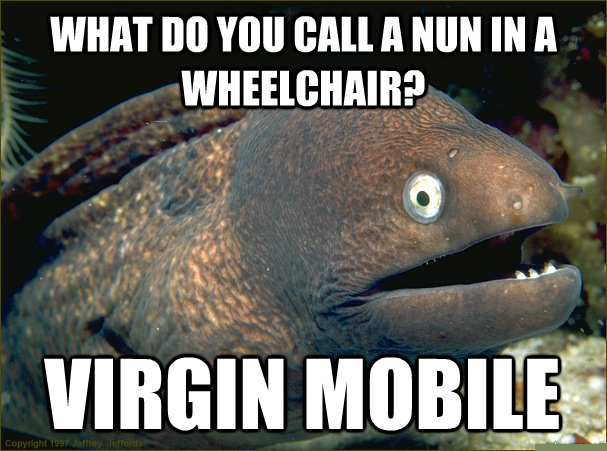 Bad Joke Eel: "What do they call a nun in a wheel chair?" 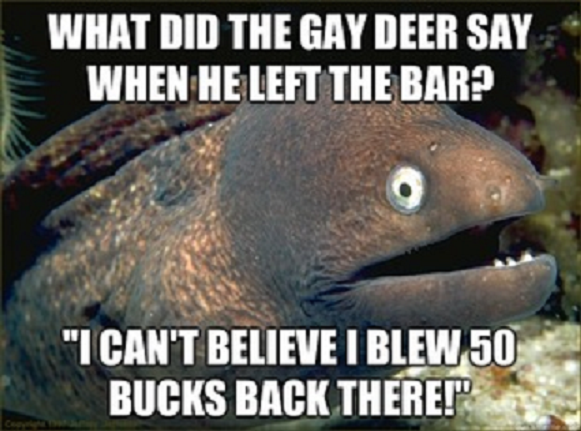 Bad Joke Eel: "What did the gay deer say when he left the bar?" 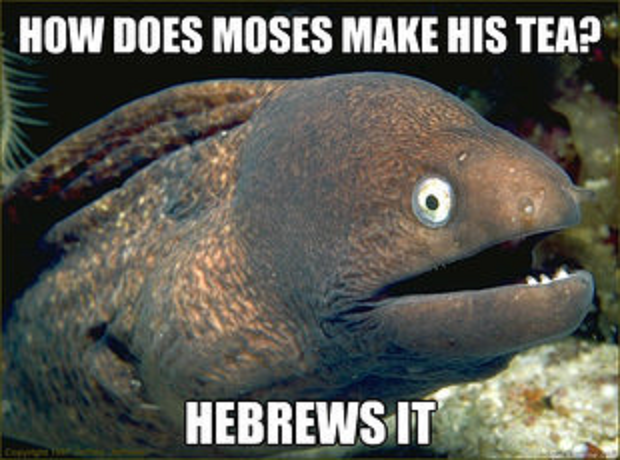 Bad Joke Eel: "How does Moses make his tea?" 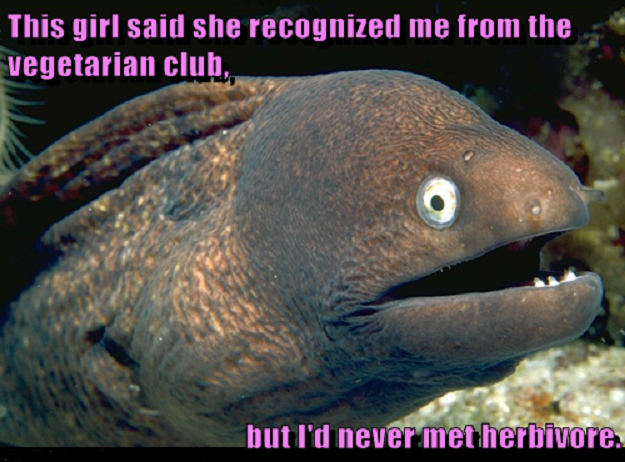 Bad Joke Eel: "This girl said she recognized me from the vegetarian club, but I never met herbivore." 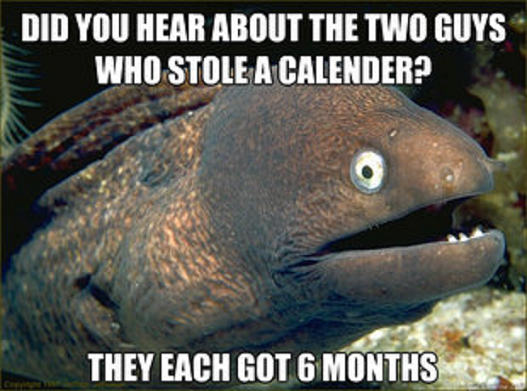 Bad Joke Eel: "Did you hear about 2 guys who stole a calender?" 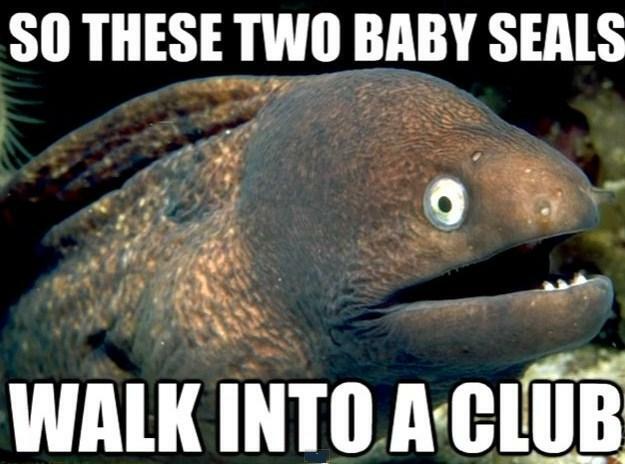 Bad Joke Eel: "So these two baby seals walk into a club..."
Bad Joke Eel: "What did the buffalo say to his son when he left for college?" Bad Joke Eel: "I guess that's what you call a constellation prize"
Bad Joke Eel: "What did one eel say to the other eel?" Well, kids... that will end our buoyant voyage through the internets today. "Eels look like they just told a joke and are waiting for a reaction." I will never be able to look at an eel the same way again. 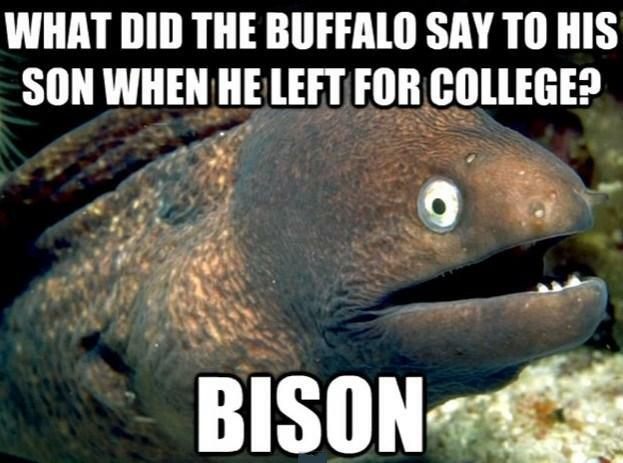 I would love to have a pet eel that could tell jokes like that. If it told a good one, I would throw a Scooby snack into its mouth. Do you think eels would like Scooby snacks? Gorilla, I think everyone likes Scooby snacks. Those are terrible, terrible jokes. So why can't I stop laughing? Mark, probably some kind of eel reverse hypnosis. 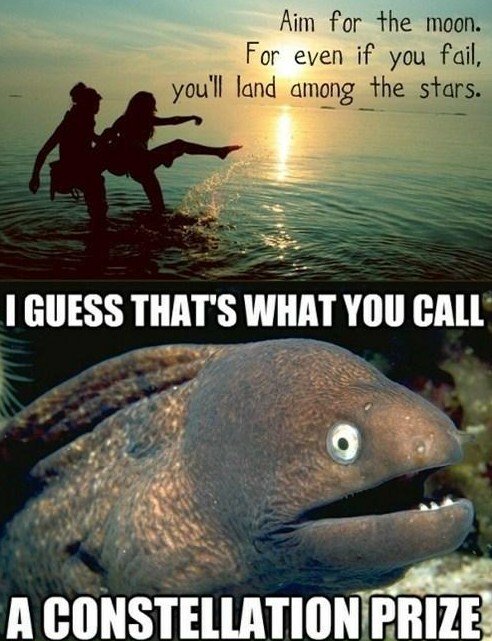 Ahahaaaa I love the bad joke eel meme! So, so very much. Awww, give 'em a hug, Spazz. That last one is the best one! What did one blogger say to the other blogger? Ahhhh...don't even try it, Bersercules! I was gonna try using that joke at work, but I have a feeling whoever I told it to, would just stare at me like I was completely insane. Great to hear from you again. Now is the time I would be traditionally sitting down with my Taco Bell meal to watch one of your videos. ::wipes tear away from my eye:: Ohh, the nostalgia. Have no fear, I just posted another review on my YouTube account! I've still got a few I haven't published and am working on a few more, I didn't give up making reviews (I love it too much) I just had to stop blogging cause it took up soooooo much of my time! YAY! 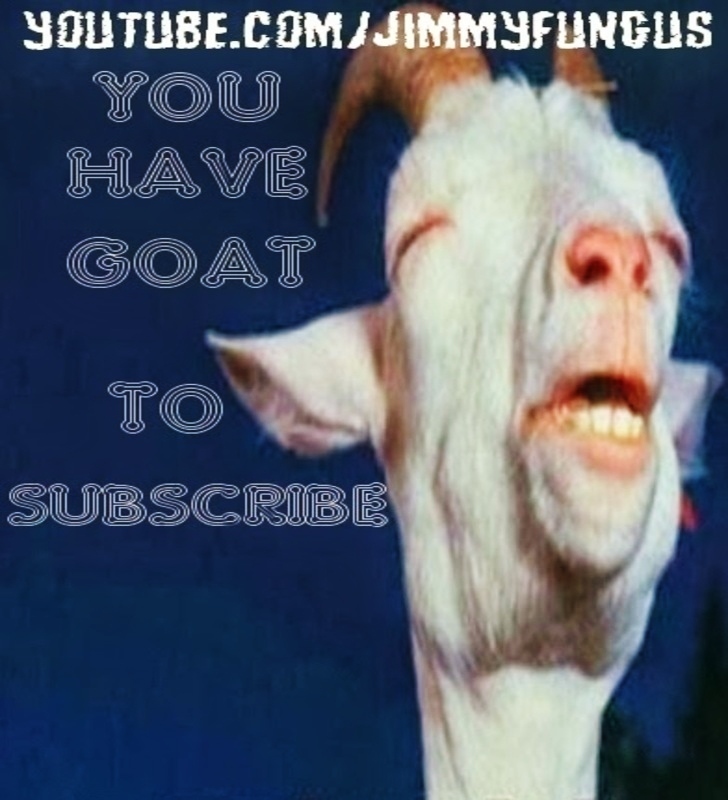 That is great news (that you will still be making videos). I love, love me some bad puns!! 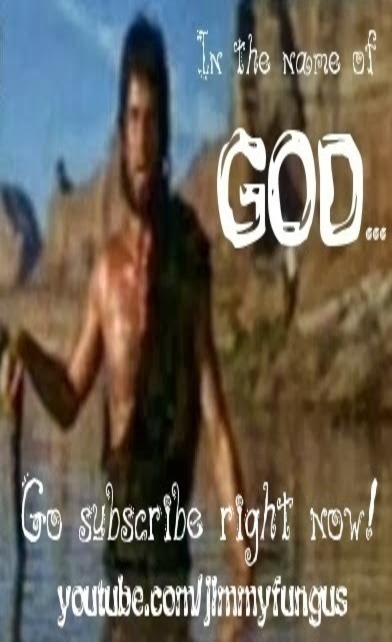 I especially, adore bad joke eel! a man took his six year old son to his first football match joke. afterwards, he asked the boy what he thought of the game. "It was exciting," he replied. "But I don't understand why they were killing each other for 25 cents." "What do you mean?" the dad asked. "Well, everyone kept yelling, 'Get the quarter back!" Great joke, Poke! Probably too good for bad joke eel to tell.